Here’s a really long story about what happened to me when I tried to get home from Pittsburgh Friday. So, as you know I travel a lot for work. Like, a lot. At this point, I am very comfortable with air travel and few things rattle me. But trying to get home Friday just about used up every ounce of travel patience and goodwill I had left. I was scheduled to return to Pittsburgh Friday evening. But when I went to check into my flight, I found I wasn’t assigned a seat, meaning that they were oversold. Because I didn’t have a seat, I couldn’t get a boarding pass on my phone like I usually do. So I went to the ticketing counter to get a paper boarding pass. The ticketing agent confirmed that the flight was oversold and they were looking for volunteers to take an alternate flight that arrived just a few minutes after the scheduled flight. I figured I could use the voucher they were offering, so I decided to be a good person and volunteer my seat for the alternate flight. Let this be a lesson: never, ever try to be a “good person” when you are traveling. Look out for #1 always, because the “good” travelers always get screwed in the end. So they booked me on a flight on a different airline to Los Angeles and from there back on my normal airline to San Francisco. They even gave me a very nice exit row seat with extra room and no seat mates. Score, and I had a pleasant flight to LAX. Then things got crazy. It had been a long time since I connected through LAX, but if you haven’t been, each airline has a separate terminal with a separate security entrance point. Which meant I basically had to exit the airport and go through security again to change planes. Okay, no problem. I had plenty of time in between connections. Then at the security checkpoint I noticed that my boarding pass stated “no ticket assigned” so they wouldn’t let me through security. I went to the ticket counter to have then print me a new boarding pass, thinking that maybe the ticketing agent wasn’t able to print me a boarding pass from my normal airline. But the LAX ticketing agent looked at my ticket and said, “That’s not an <airline> flight. That’s a <some airline I’ve never heard of before> flight, and you need to go to their ticketing counter 2 terminals away.” Seriously? WTH? So with about a half hour left until boarding, I’m running down the unloading zone at LAX in my nice business flats (thank the lucky stars I didn’t pack heels on this trip!) to Terminal 5, where I go to a ticketing counter of an airline I’ve never heard of before to find no one there. You’re kidding me. So back I go to the previous ticketing counter, where it then dawns on me that I just earned my frequent flier status, meaning I can talk to the business class ticketing agents, meaning I don’t have to stand in the ever-growing main cabin line. Finally, a stroke of luck! 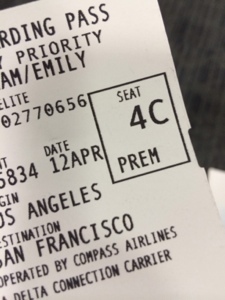 The ticketing agenda figured things out right away and gave me a first-class upgrade on my connection to SFO! Happy dance! See the date? April 12. That’s Saturday. This is Friday. The ticketing agent booked me for a flight the next morning. So now the flight I want to be on is boarding, and I don’t have a ticket. I run to the customer service desk to only be stuck behind a huge line of passengers also trying to resolve their issues last-minute. I text Hulk that I might not make it home that night, to which he responds to call Customer Service while I’m standing in line. He is a genius, did I ever mention that? So I call and get my issue resolved before the line even creeps forward at the customer service desk. They put me on the flight that’s leaving RIGHT NOW and I run back to the gate just in time to board the plane. Oh, and the whole time I’m trying to not throw up because of morning sickness that doesn’t really happen in the morning, it happens at any time. So here’s where my nice side is always stumped. Do I call and alert my airline what happened to me? I was totally going to call some one and give them an earful when I was super panicked and angry running from terminal to terminal. Now that I’ve had a chance to calm down, is it even worth a call? I was still able to get the problem fixed, but on the other hand they should probably know how the mistake happened (the ticketing agent in Pittsburgh assigned me to the wrong Saturday morning flight to begin with and no one caught it until I got to the gate) so they can put preventative measures it to discourage a repeat event. Anyway, that’s my story about how I’m not going to try to be a nice person when I travel anymore. That is not a fun situation at all. It sounds like you had some composure. At least your cross-country flight was a comfortable one, though. Welcome back to the City!